Hoffman Weber offers a variety of commercial roofing and roof replacement services. 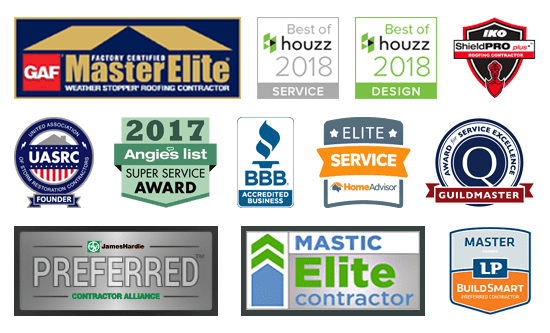 We partner with property management companies, business owners, and worship communities to protect their investments through high-quality roofing. In today's housing market, every opportunity to maintain or increase your property value is critical. A new roof from Hoffman Weber can help attract new buyers or renters by enhancing the overall look of your property. A new roof can also keep current residents happy by delivering a highly visible return on their association fees, with benefits they'll truly appreciate every day of the year. When you work with us, you can count on the work being done on time, on budget, and delivered as promised. As a member of MHA, we're dedicated to providing property owners and associations with the best work possible. Get in touch today to develop a working relationship that can continue to enhance your property for years to come. Your potential tenants get their first impression of your apartment complex from the building's exterior. A quality appearance shows people that you take pride in caring for your property both inside and out. With a new roof from Hoffman Weber, you can attract new tenants and increase your property value. You can rest assured that we know how to work best with you and deliver you maximum value for your investment. We're an active member of MHA, a non-profit committed to the highest standards for multi-family property owners in Minnesota. We do this work regularly, and we know you'll be happy with the results. You can help preserve and protect your worship community with a new roof. Parishioners can rest assured their fiscal contributions are being put back into something that the entire congregation can benefit from. Many business owners have never set foot on their roof, and may not ever think about it until something goes wrong. When a storm strikes or the roof begins to leak due to old age, you'll need someone you can trust to get the job done right, on time and within your budget. At Hoffman Weber, we're always ready to take that call. As a HAAG Certified Inspector, Hoffman Weber will provide you with a thorough report on the condition of your flat roof system. Our flat roofing services extend to all types: Built-Up, Polymer-Modified (BUR), Thermoplastic (TPO and PVC), Thermoset (EPDM), Spray Foam (SPF), and Metal. Contact us today to take your first step toward a new roof for your property. We’d be happy to come out, assess the current state of your roof, and draft an estimate.